I seem to be running further and further behind in the articles that require publishing. But breaking news events crossing my desk shove "works in progress" to the back of the queue! 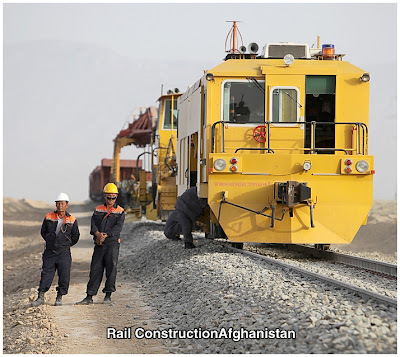 This article will "connect the dots" between the significance of the opening a a new rail line, to the overall development of Afghanistan's astonishing mineral wealth potential, with a number of countries plans for profiteering, including the US. So bear with me. "The opening of Afghanistan's first major railroad in August promises transformative economic and geopolitical changes that are yet to be fully understood. The recent completion of a railroad line from the Afghan-Uzbek border to Mazar-i-Sharif will be complemented by a railroad from Iran. 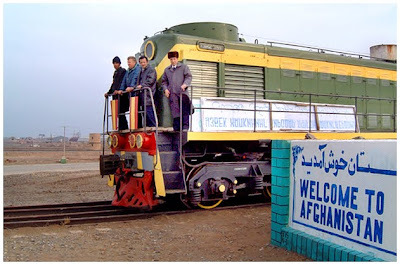 "Along with railroads planned by China and Pakistan, this will create economic synergies as Afghanistan is integrated with the railroads of its neighbors. Geopolitically, the Afghan railroads dovetail with China's massive railroad program in Central Asia, Pakistan and Iran. Further, as Iran, Pakistan and Russia are hedging their bets on a U.S. troop withdrawal, railroads will strengthen their influence in Afghanistan. The railroad frenzy should be seen in this light." 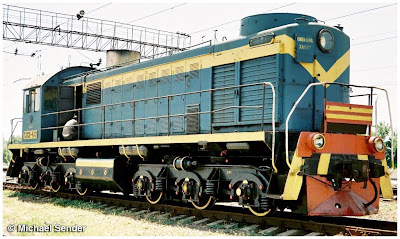 Bryansk Machine Building Plant manufactures diesel-electric and electric locomotives. BMBP in Russia is the largest manufacturer of rolling stock in the Commonwealth of Independent States (CIS), as well as marine engines. China South Locomotive and Rolling Stock Corporation (CSR) in China, is another major player, with recent deliveries in the CIS. • December 24, 1979. 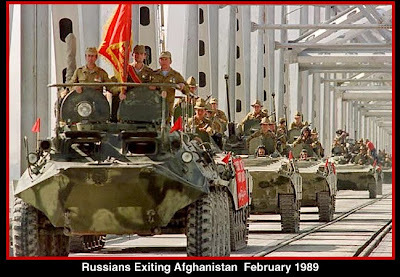 Russian troops entered Afghanistan, ostensibly to support the seated Afghan government involved in a civil war with the Mujaheddin. 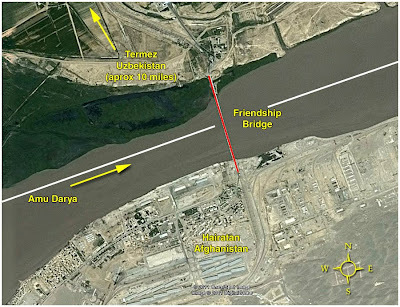 • The Amu Darya, [Darya = river] forming the border between Uzbekistan and Afghanistan, posed a major obstacle for supporting the Russian initiative. Material and supplies had to be barged across the river to support the Russian troops. • 1982. The Russians compete the "Friendship Bridge." The bridge is 820 meters (2,690 feet) long and 15 meters (49 feet) wide. A single rail line bisects the motor vehicle lanes. Enters Afghanistan at Hairatan. • February 16, 1989. 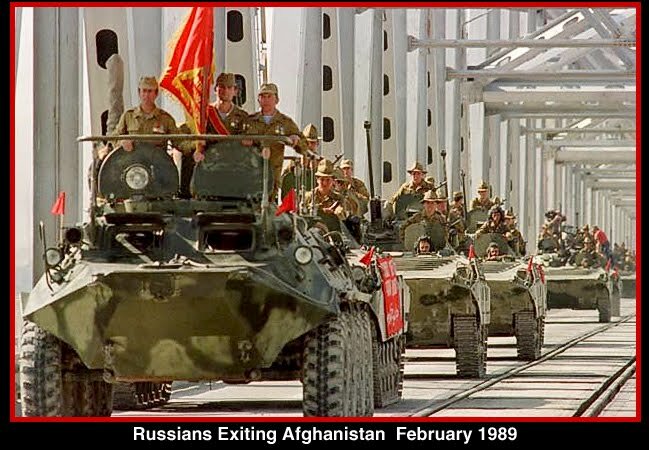 The last Russians leave Afghanistan, crossing Friendship Bridge, led by Lt. Gen. Boris V. Gromov. The Russian Army had been in country nine years and 50 days. • September 9, 2001. 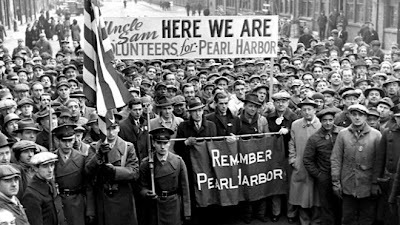 President Bush signs detailed plans for a worldwide war against al-Qaida two days before Sept. 11th, but did not have the chance to launch his plan before the terrorist attacks in New York and Washington. • October 1, 2001. US troops finally invade Afghanistan. • December 9, 2001. Following extensive repairs, Uzbek and Afghan authorities reopen Friendship Bridge, and sign an agreement on the passage of humanitarian cargo across the structure. The most famous trade routes in Eurasia were known collectively known as the Silk Road. 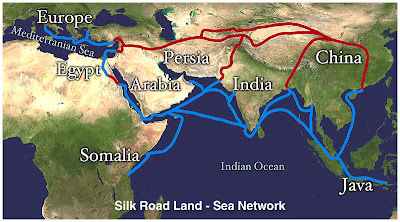 The Silk Road was not one well-established road, but a complex, constantly-changing network of land and sea routes between China, the Middle East, the Mediterranean, and Europe that was in operation roughly from the 1st century B.C. to the A.D. 15th century. The name "Silk Road" was coined in 1870 by German geographer Ferdinand van Richthofen, the uncle of the WWI German Ace, Red Baron. [factsanddetails.com] Afghanistan was part of that ancient network. 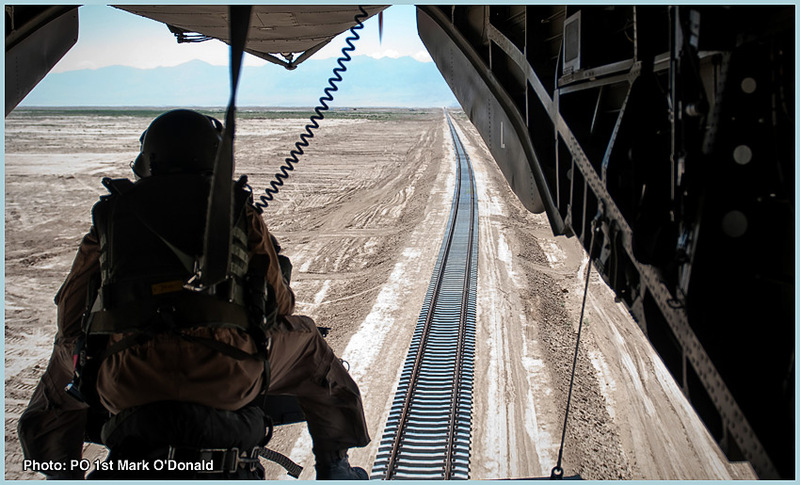 Now, in 2011, Afghanistan finds itself in the center of a dramatic revival of the Silk Road, with steel rails replacing dirt trails. 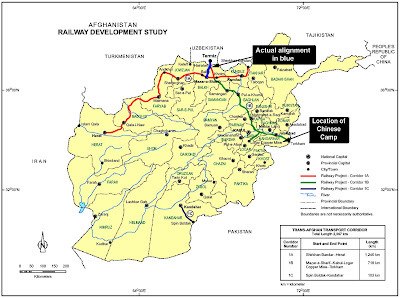 Afghanistan made several feeble attempts to build a railroad. 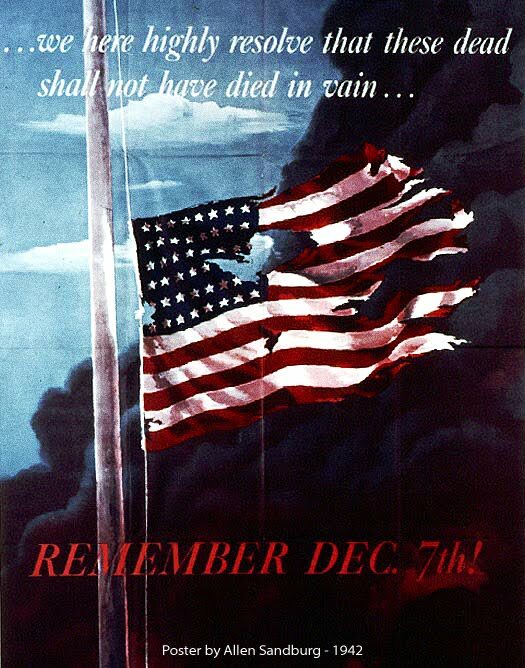 The efforts were short lived, and faded into obscurity. In recent years, a number of studies have been completed, many of which came to the same conclusion. For the county to flourish, it had to establish a rail transportation system. 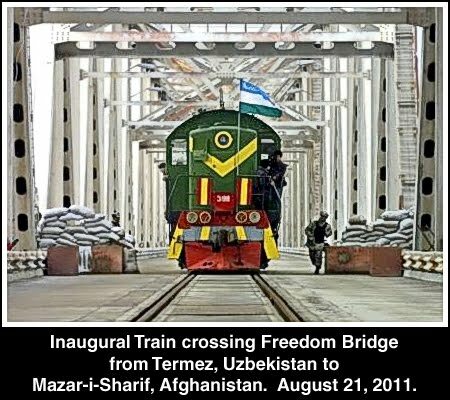 The nearest "port of entry" for rail is Termez, just across the Friendship Bridge from Afghanistan, in neighboring Uzbekistan. The relationship between the United States and Uzbekistan has been battered by human rights abuses. (Where else in the world is boiling a human in oil recognized as a form of punishment?) Undeterred by such trivial matters, General Motors recently opened an engine plant in Tashkent. 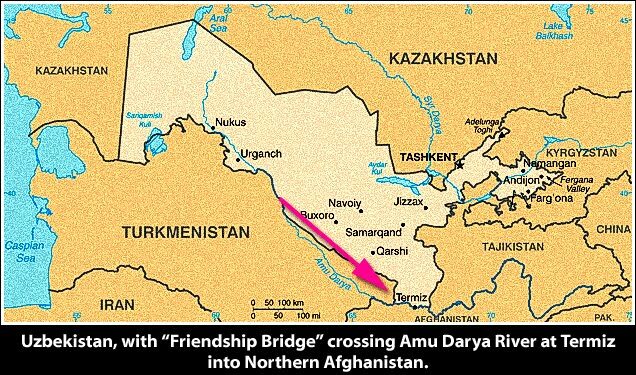 This warm "touchie-feelie" relationship brought about by the railroad project, is in sharp contrast to the fact that the border between Afghanistan and Uzbekistan is the second "most intense" border in the world, eclipsed only by the North - South Korean border! 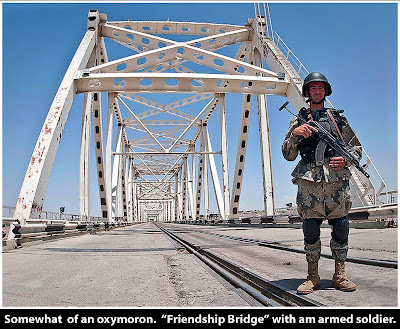 It consists of a barbed wire fence and a second, taller, 380-volt electrified barbed-wire fence, land mines and a patrol of heavily armed Uzbek soldiers! 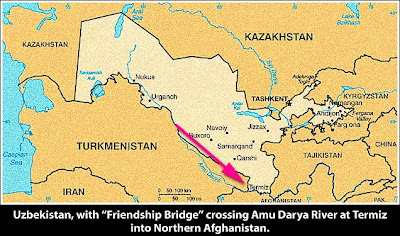 It stretches along the entire Uzbek-Afghan frontier stretching 209 km (130 miles) defined by the Amu River, from Turkmenistan to Tajikistan. 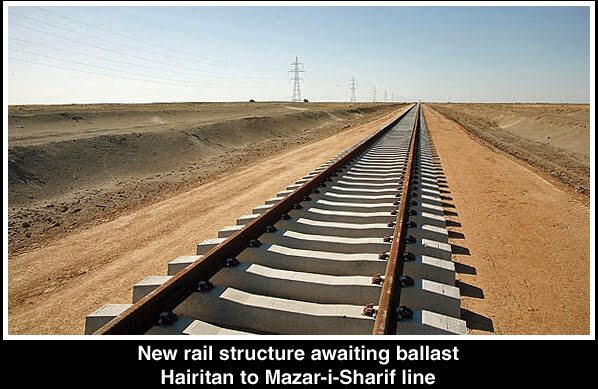 The Hairatan-Mazar-i-Sharif rail project is the first substantial common carrier railroad project in Afghanistan. The 75km (46 mile) rail link connects Hairatan on the Uzbekistan-Afghan border to the city of Mazar-i-Sharif in northern Afghanistan. The state-owned Uzbekistanllari (UTY) built the project. Construction began in January 22, 2010 and was completed in May 2010. The first train consisting of one locomotive and seven coaches traveled the line on August 21, 2011. Estimated cost was (USD) $170m, of which the Asian Development Bank (ADB) provided $165m. The Afghan Government provided the remaining $5m. 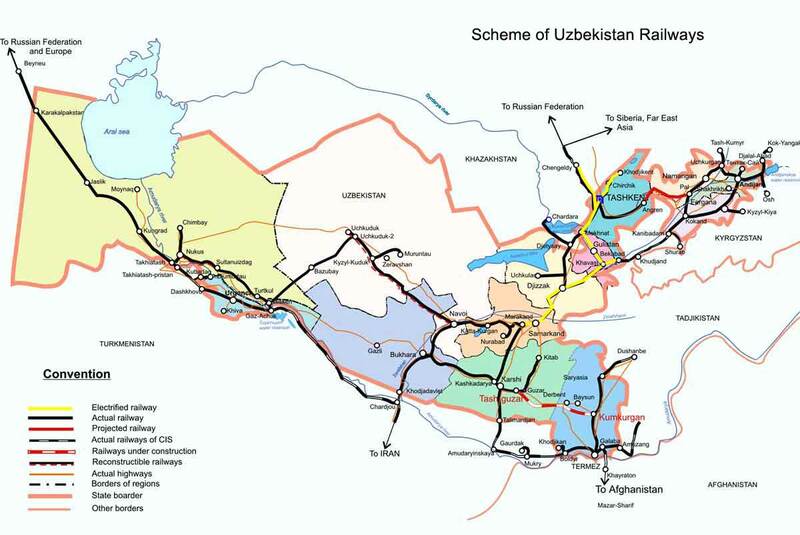 The rail line was constructed by [U]Uzbekistan [T]temir [Y]yullari - Uzbekistan Railways (UTY). 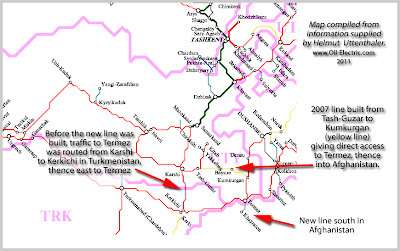 UTY will operate the Hairatan to Mazar-i-Sharif line until such time as Afghans can be trained to operate locomotives. 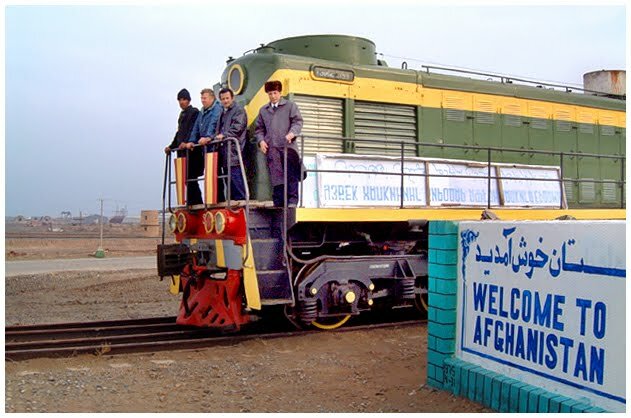 To be clear - Afghanistan does not own locomotives or rolling stock. The state railway company Uzbekistan Railways (UTY) is one of the largest in Central Asian region. It was established in 1994. 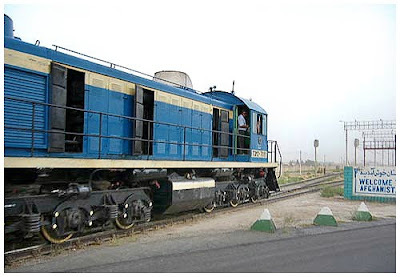 The rail project did not require any new investments in rolling stock because Uzbekistan vehicles have been used. Uzbekistan obtained its railway fleet from the Soviet Union during the separation in 1991. 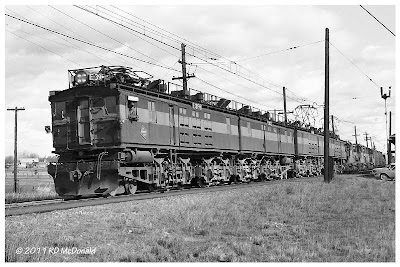 "The Alco RSD 1 were built from 1942, some delivered to the US Army, 70 were shipped to the Soviet Railways and further diesel developments. The Russian TEM series were derived from them." 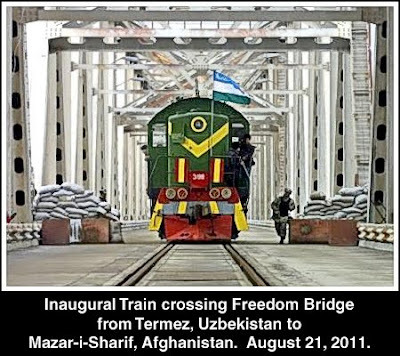 "Four years ago [August, 2007] Uzbekistan opened the new line Tashguzar - Kumkurgan. 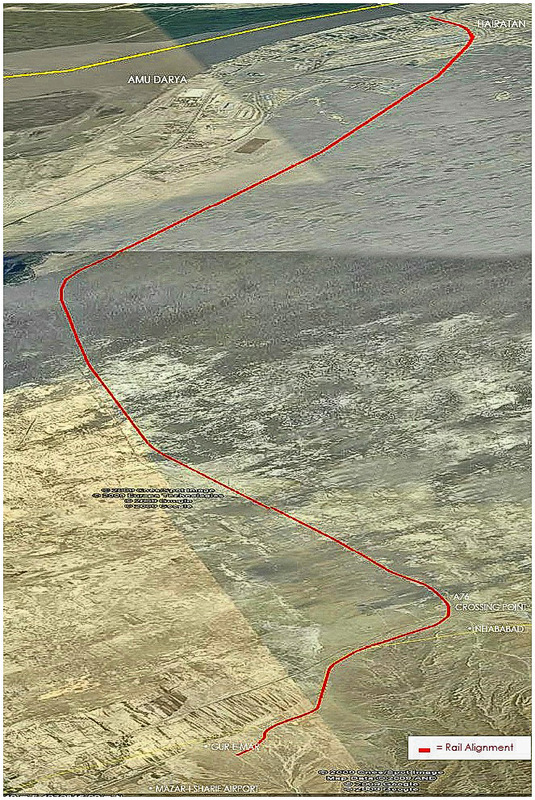 With this line, they connected Termez (from where the line to Afghanistan starts) to the rest of the Uzbek railway network. Before that, trains had to go via Turkmenistan to reach Termez." Study map below. Is the War in Afghanistan a profit driven "Resource War?" Afghan officials believed the American estimates of the value of Afghanistan's mineral deposits - nearly $1 trillion -were too conservative, and that they could be worth as much as $3 trillion. Complicating the development of Afghanistan's mineral deposits is rampant corruption in the private sector and government, a raging insurgency -Taliban - that threaten personnel and transportation, and a lack of highway and rail infrastructure. "It has long been known that Afghanistan had significant deposits of gemstones, copper and other minerals, but United States officials say they have discovered and documented major, previously unknown deposits, including copper, iron, gold and industrial metals like lithium. "But executives with international mining firms said in interviews that while they believed that Afghanistan's mineral deposits held great potential, their businesses were not planning to move into the country until the war was over and the country more stable. "There are huge deposits there," said David Beatty, chief executive of Rio-Novo Gold, a mining company based in Toronto. "But as chief executive, would I send a team to Kandahar? And then call a guy's wife after he gets shot? No." Indeed, Afghanistan expects to rely on international economic aid until 2025, The Washington Post reports. I wonder if the "average tax payer" is even aware of just what we are sending to Afghanistan, while our kids are sharing beat up school books! Among those lining up for the Fête Costumée: China, Japan, South Korea and India. Within an hours drive from Kabul, two massive iron ore reserves have been identified, the Hajigak iron ore deposit and the Syadara iron ore deposit. Last month, Afghanistan awarded a number of concessions for mineral development. India and Canada will begin developing the Hajigak Iron Ore Deposit. Canada's Kilo Goldmines, Ltd. was included, based on their outstanding record of resource development. 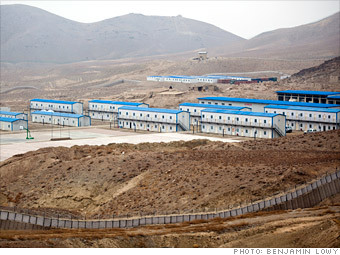 New Chinese mining camp in Afghanistan. Note protective wall. Meanwhile, China Metallurgical Group has signed an agreement to construct 718 km (446 mile) rail line from Afghanistan to Pakistan. Notice the recently completed Hairatan - Mazar-i-Sharif, forms the hub for north-south and east-west rail infrastructure development. And the BBC Business News reported today (Dec 26, 2011) "China has gained potential access to millions of barrels of oil after it won approval for oil exploration and extraction in Afghanistan. Afghans approved an agreement allowing China National Petroleum Corporation (CNPC) to develop a field holding an estimated 87 million barrels of oil." So. 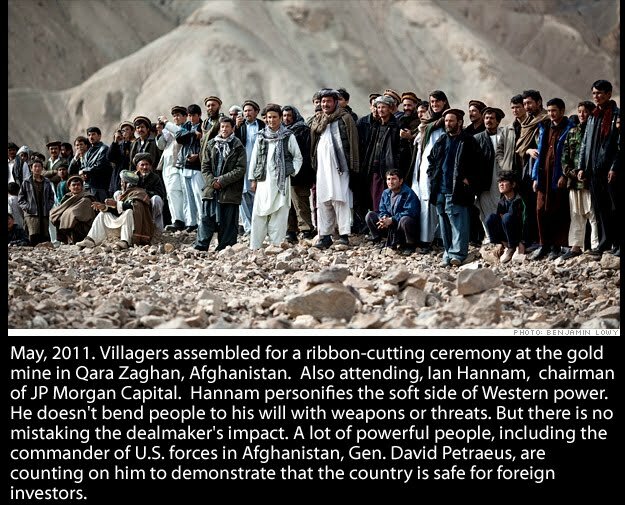 Where does the United States figure in this modern day land rush for Afghanistan's mineral wealth? Well, back in January 2011, Afghan Krystal Natural Resources announced it had signed a USD $50M deal [ed note: "Where did they get that money?" I understood they were broke] backed by foreign investors, to develop the country's second gold mine, a project the government hopes will attract more money to the war-torn region. Question. Who could those "foreign investors" be? Like you, I thought once bin-Laden was slain, the United States would begin withdrawing from Afghanistan. Nope! So. The question becomes one of, "How long do you think the United States will have troops stationed in Afghanistan?" 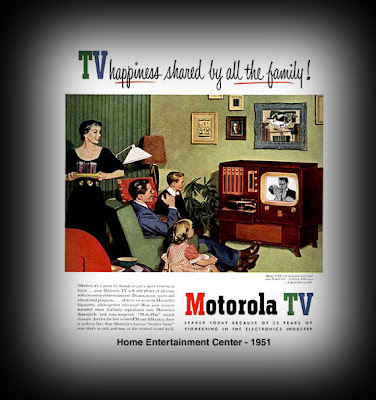 After all, someone is going to have to protect profiteer JP Morgan's latest investment! Suggested Reading: I hope this article has stimulated your desire to learn more about Afghanistan. And while I believe our troops should have been on the next bus out of town after bin Laden was assassinated, I made a conscious effort not to politicize this story. On the other hand. a spade IS a spade. However! If you can "connect the dots," and "read between the lines," you, like me, will be totally stunned to realize the implications of mineral development affecting the economic growth potential for Afghanistan and foreign profiteering. Highly recommend the Blog "Railways of Afghanistan." Very informative. Afghanistan's Socio-Economic relationship with her neighbors. The Japanese, Chinese, Indian and Korean initiatives. Hajigak: The Socio-Economic impact, resulting from foreign investment and wartime profiteering. The Shirbatu Granite Complex. 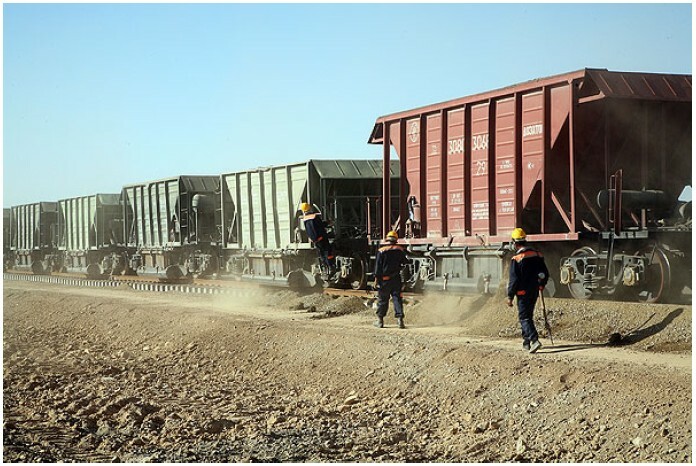 The Chinese proposed railway infrastructure would permit bulk transportation of granite slabs to markets in Kabul and the northern region and thus enhance the economic viability of mass production of this huge high quality construction and decorative grade granite resource. Uzbekistan Collection of Helmut Uttenthaler. 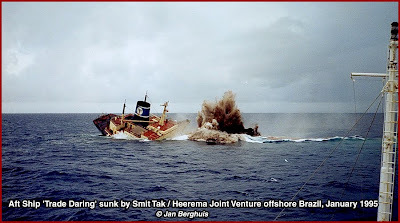 Photographic works of Jim Sender. The Russian TEM2 Series and Modifications. This particular unit was in Lithuania, demonstrating the prolific engagement of this design, based on the ALCo RSD-1! 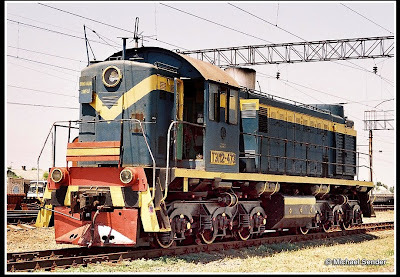 "A Russia Classic, based on the ALCo RS-1, 70 were shipped to Soviet Railways." The TEM2 is a refinement of the TEM1. The TEM1 was based on the Alco RSD-1. As a "hood unit," use in the Russian climate was difficult. 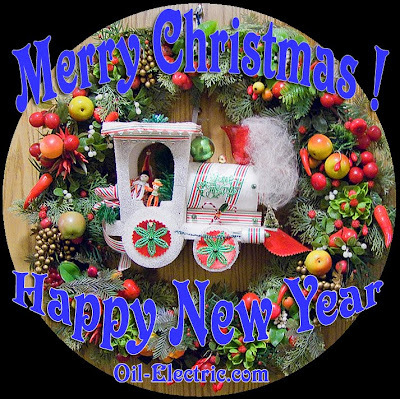 The fact is, many Russian engineers favored Baldwin diesel designs over ALCo to mimic. 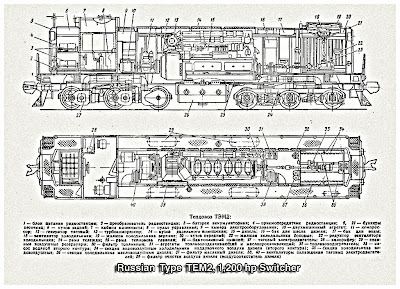 In the end, Joseph Stalin gave the order to build a comparable locomotive based on RSD-1. And many were built! The Penzenskiy works set about manufacturing the TEM1 Classin 1951, and a more advanced version as shown here, the TEM2 Class, began production in 1960. Mass production of this Class began in 1968 at Bryansk Machine. Turbo charging increased horsepower 1,000 hp to 1,200 hp. (TEM1 migration to TEM2). Gauge: "Russian gauge, 1520 mm (4′ 11⅚″) commonly rounded up to 5' gauge. Users: Eesti Raudtee EVR, RZD, Sillamäe Sadam, Spacecom, Transoil, et al! Seen in: Russia, Estonia, Latvia, Lithuania, Ukraine, probably much of the ex. Eastern Europe and anywhere where 1520 mm (4'11") gauge is common. Engine: Penza PD1, 4 stroke 6 cylinder, turbocharged PD1M available from 1968. Center Bolster: 33'-00" / 32'-05"
Center Front Truck to Front Pilot: 9'-03" / 6'-11"
Center Rear Truck to Rear Pilot: 9'-03" / 6'-07"
Distance between Truck Centers: 43'-06" / 36'-06"
Transmashholding TEM2 Rebuild Program, including ECP brake system. 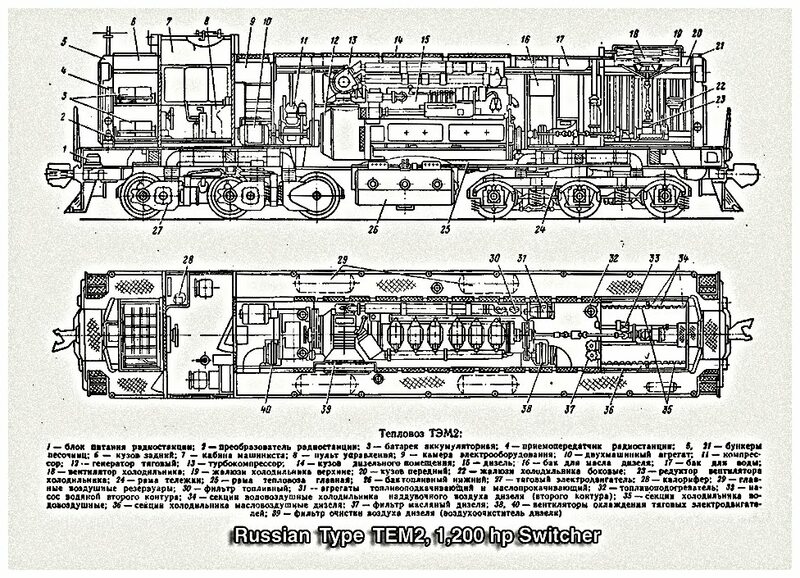 The Russian SA3 coupler was introduced during the rebuilding of the railway network in Soviet Union after WWII used on the whole broad gauge network, including Finland and Uzbekistan, Mongolia, Iraq and on Malmbanan in Sweden for ore trains. And now, Afghanistan. • Russian trains are rarely longer than about 750m (2,460 ft),rarely exceed a maximum tonnage of about 6,000 tons. 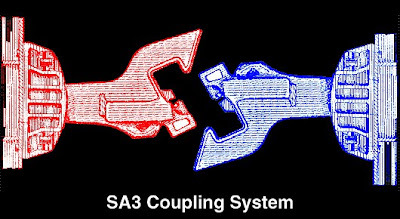 • The proposed European automatic coupler is compatible with the Russian coupler but with automatic air, control and power connections. Last, but certainly not least, an article as complex as this could not be possible without the valuable input from a number of sources, including Tobias Köhler, Helmut Uttenthaler, and Jim Sender. 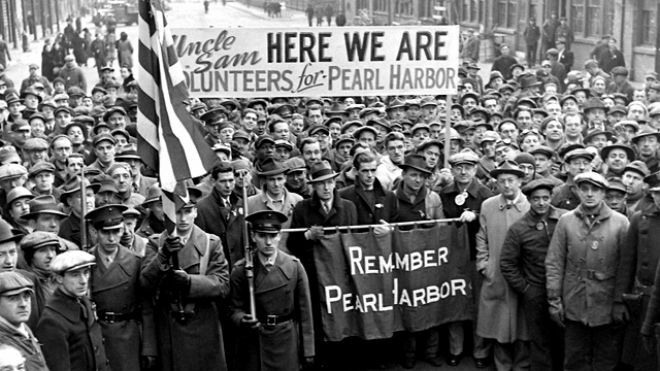 Thank you, Gentlemen! For more of America disappearing in the rear view mirror, read. 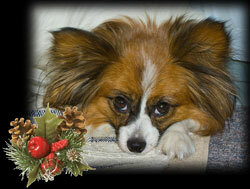 Seasons Greetings from Robert (and GingerSnap) in Port Townsend! We hope you are able to make the best of whatever situation life may find you in at this time. My mom made the wreath and Santa locomotive back in the 1960's. 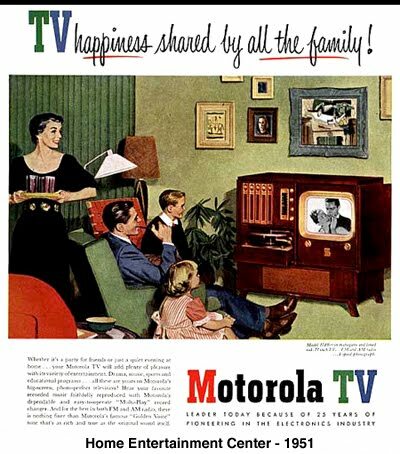 It has survived a dozen marriages and hundreds of moves. It recently won First Prize in the annual "decorate your front door contest" where I dwell. And what is Christmas without Christmas music! One of my favorites back in the days when I was a country-western deejay. From 1970, "Country" Charlie Pride! Wednesday is the first day of Summer. That is, if you live in Brasil, South Africa, or Australia. Here in the Northern Territories, it is the first day of winter. From now on, the days will be getting longer, by an average of two minutes per day. Time to get the tank tops and shorts in the washer! 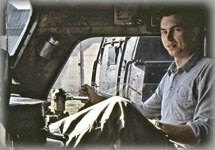 It's an overcast Tuesday afternoon, March 28, 1961, just west of Ellensburg, Washington. 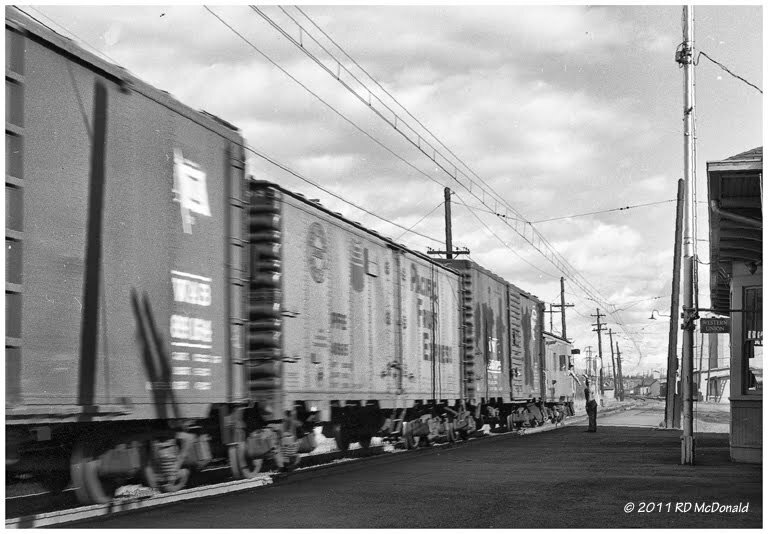 Four General Electric box cabs, E39A-D, plus three General Motors GP9's have been stopped to pickup train orders. The fireman kept motioning to me, so after I took the shot, I headed over to see what he was trying to communicate. He was saying, "Watch out for rattle snakes!" Then the growlers begin to moan and groan easing into the grade ahead. The conductor grabs his set of flimseys on the fly. Every amp will be needed for the Cascade crossing ahead, before descending to Black River Junction. 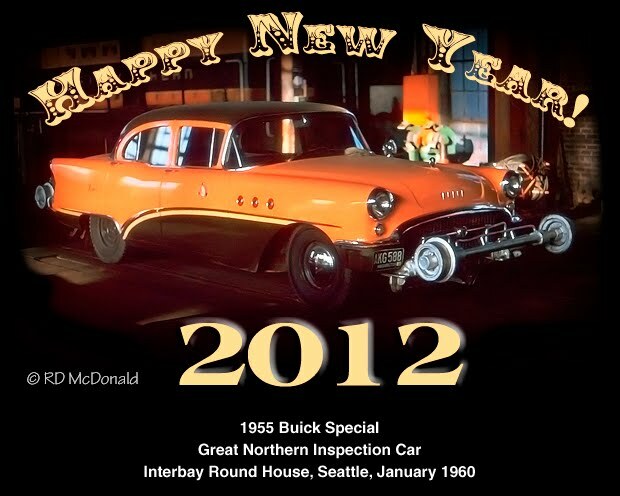 Click on photo of E39 for your FREE 2012 O-E calendar! 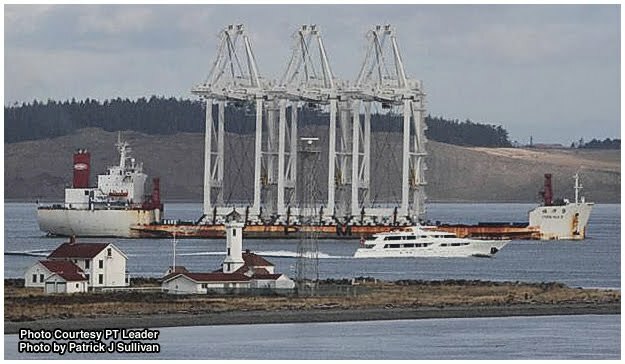 Several days ago, our hometown newspaper, the Port Townsend Leader, featured a photo of the Zhen Hua 9 entering Puget Sound with three massive container cranes, the first of six, bound for the Port of Seattle's Terminal 18. 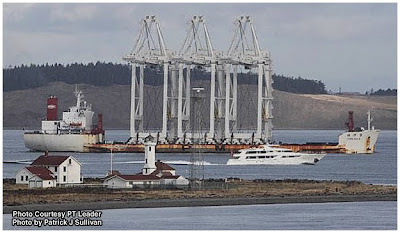 She looks a little tender with 185 foot high cranes rising high above her deck, as compared to her 41 foot draft. But like Seattle's Space Needle, her center of gravity is surprisingly low. But there is more behind the dramatic photograph than meets the eye. The real question is "What is wrong with this photograph?" Plenty. 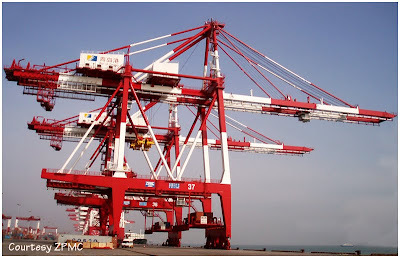 Each of the cranes are built by Zhangiagang Port Machinery Company (ZPMC), a division of Shanghai Zhenhua Heavy Industries Company, Ltd., headquartered in Shanghai. Each crane is valued at approximately USD $9m. 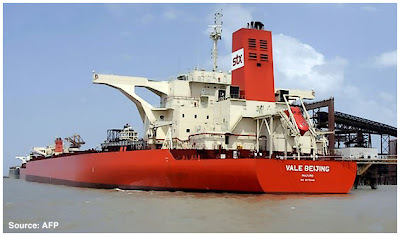 Shanghai Zhenhua Heavy Industries also owns and operates Shanghai Zenhua Shipping Company, operating the Zhen Hua 9, built in Japan, manned by largely Chinese crews. 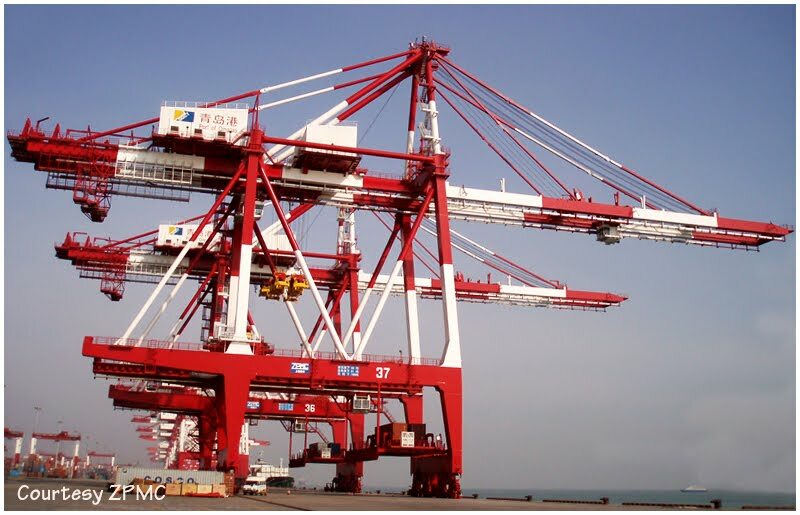 The new generation of long-reach container cranes is necessary to service a new generation of "Super Panamax" container ships, scheduled to be built in either China or South Korea. These ships will carry more containers, carrying almost everything you see in your local WalMart, K-Mart and so on. As compared to our top five exports to China, including computers, crop production, chemicals, transportation equipment and machinery. 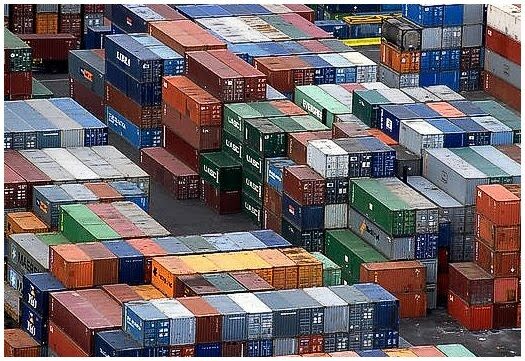 A hefty number of containers are never re-filled with US goods to go back to China. 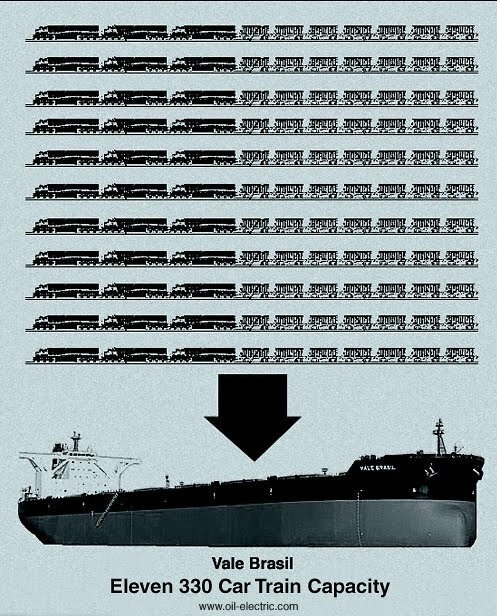 Those are seen stacked in huge numbers around Seattle and Tacoma, as well as Portland - virtually any container port. 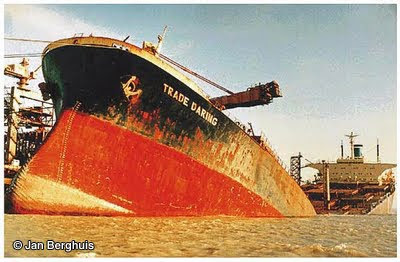 The number of idle containers reflects the imbalance of trade. In 2010, China was our third largest export country, following Canada and Mexico. Empty containers. They came here loaded. But there is nothing to ship. 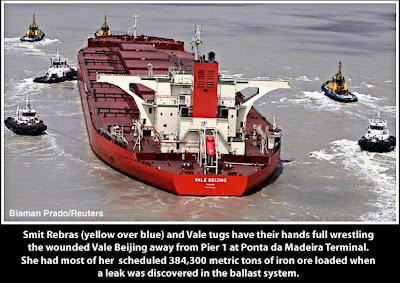 That is part of what is wrong with this photograph of the Zhen Hua 9 passing Port Wilson. Pretty sad state of affairs that our government policies and trade agreements have failed to place the USA first! Not to mention the corporate greed and desire to establish a world economy, with correspondingly flat line wages world wide. Shanghai Zhenhua Shipping Company operates a fleet 28 Special Purpose Vessels, that, through April 2010, had delivered more than 3,781 material handling cranes world wide. 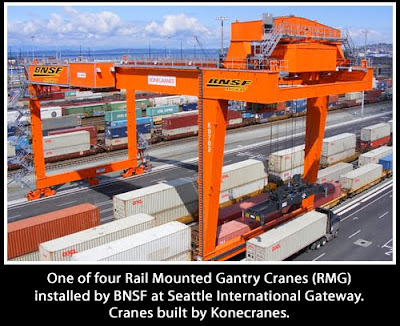 63 Rail Mounted Gantry Cranes (RMG), similar to BNSF's RMG, one of four operating at Seattle International Gateway.Three more ZPMC cranes will be delivered to Seattle's SSA Terminal 18 in 2014. 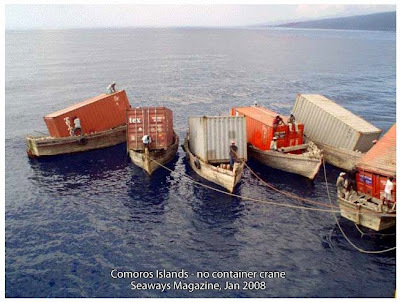 Life without a Container Crane! 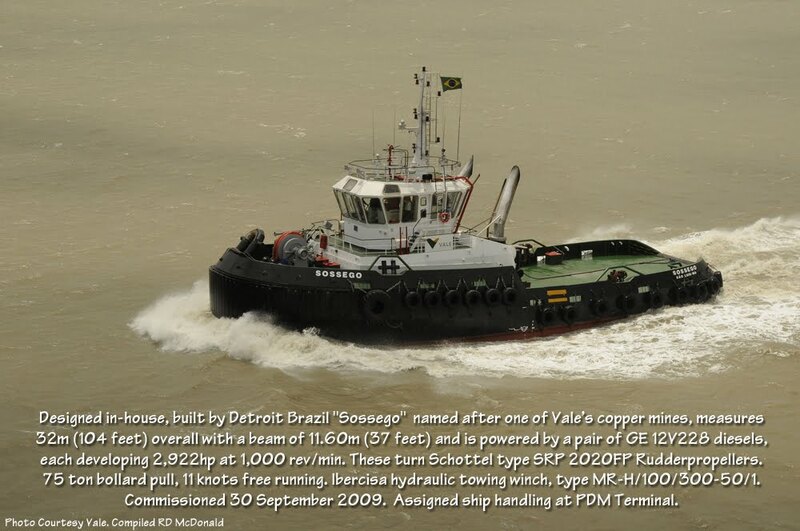 Not all deliveries are trouble free, as demonstrated by the grounding of Zhen Hua 10 off Rotterdam in 2008. I mentioned "tender" at the beginning of this article. "Tender" is used by nautical types to reflect the "tipsy" motion of a vessel. 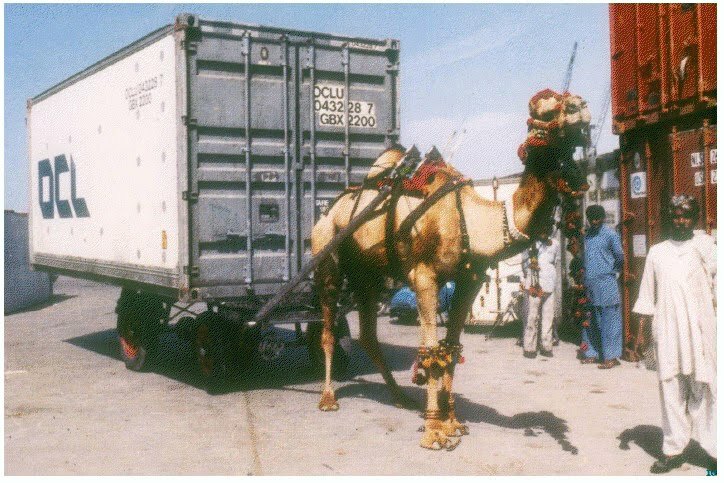 There are serious considerations given to container crane transport. The Zhen Hua 10 lost her anchor while awaiting delivery to the Port of Rotterdam. 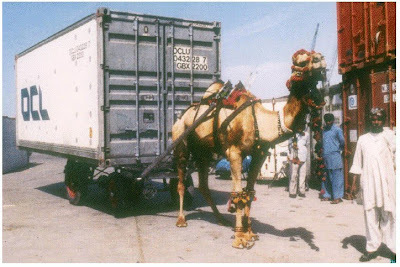 She ended up stranded on the beach.The video is a remarkable demonstration of how stable these loads are, despite the visual presentation! She eventually completed her delivery! 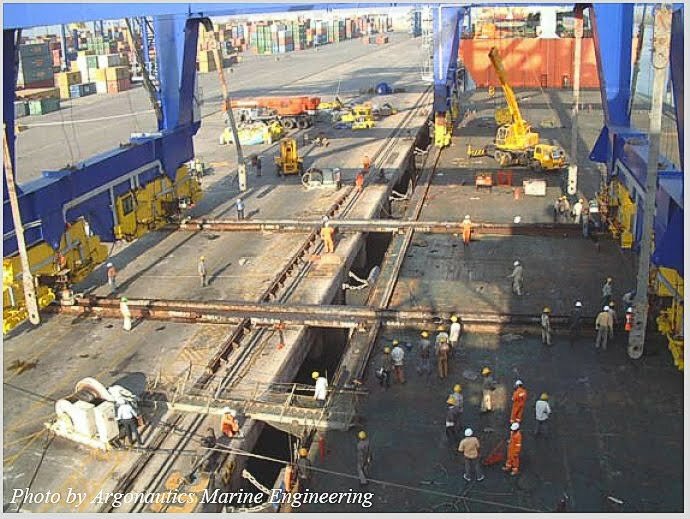 This video demonstrates how a similar type crane is unloaded from the Zhen Hua 13 onto the quay - pier. 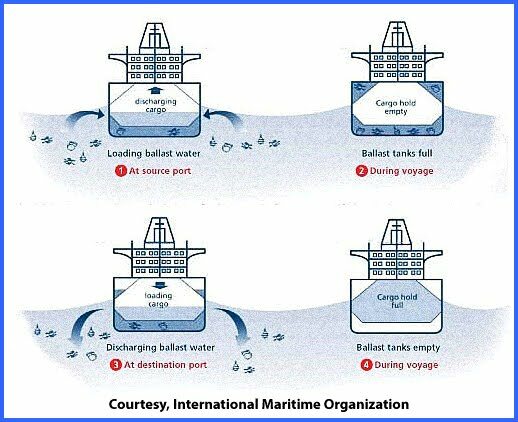 This explains why these special purpose vessels feature a lower freeboard - sit lower in the water, than a typical cargo vessel. In the video, you will see a torch cutting through a brace. These cranes are literally welded to the deck of the vessel to stabilize them in transit. 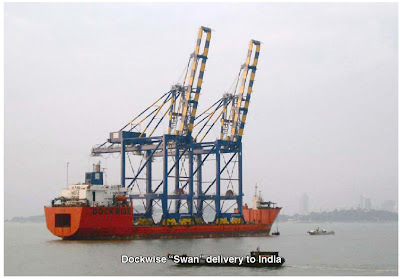 Those three S-T-S container cranes are the first of six ordered by SSA Marine. Estimated cost per crane, USD $9m. 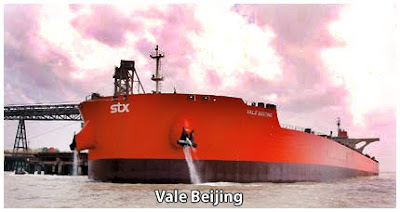 SSA Marine is a "Carrix Enterprise." Carrix and SSA continue to be controlled by the Smith family, whose forebears founded the company in Bellingham in the 1940s. Goldman Sachs Infrastructure Partners has committed to a significant equity investment in the Company, positioning Carrix to capitalize on the substantial growth opportunity in the global port operations industry. Source: Bellingham Herald. In closing, a couple of questions. Serious questions. "What happened to America's steel making ability; what happened to America's bridge building expertise; what happened to America's ship building capacity?" ZPMC successfully completed the steel structure of the San Francisco-Oakland Bay Bridge. So one of the most famous Bay Area crossings is labeled with “Made in China."